AMD is doing its best to attract the attention of investors. As part of measures to attract foreign capital Financial Analyst Day, it announced a new mobile graphics Radeon M300, focused on the use of powerful professional notebooks. AMD Radeon M300 – is a series of mobile accelerators, which are mostly intended for expensive models of laptops. However, available for laptops in this range will have plenty of chips, so AMD has covered the entire market. 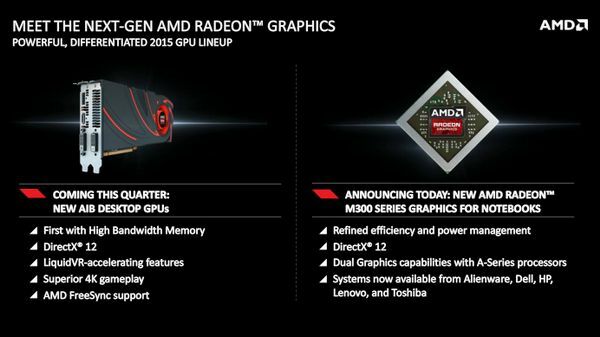 GPU specifications have not been disclosed, but it is known that many large companies are interested in this graphic. In particular, the number of buyers includes Toshiba, Lenovo and HP. The latter two companies are the top three in sales of computers and laptops throughout the world. 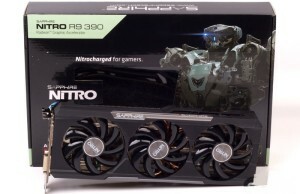 Advantage cards Radeon M300 will support DirectX 12, plus the talk of a new power control function and performance, which prolongs battery life of the notebook. Low representatives series AMD Radeon M300 acquire DDR3 memory capacity of 1 GB or 2 64-bit bus. The middle class will show a 128-bit memory interface, 2GB and type GDDR5. As for the top-end series, the memory capacity ranges from 4 to 8 GB, and the width of the channel due to the GPU has grown to 256 bits. Laptops with video cards AMD Radeon M300 will go on sale this year. We are waiting for their official announcement.